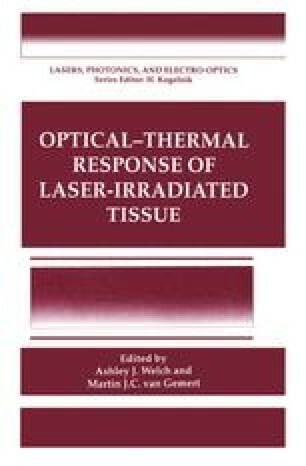 Kinetic models of thermal damage in tissues can be used to describe pathologic end points obtained with laser irradiation. Many treatment end-point goals involve relatively low temperature coagulation or desiccation of tissue, and these end points can be conveniently described by rate process models. Thermal damage is exponentially dependent on temperature and linearly dependent on time of exposure. Damage processes can be modeled as first-order rate processes for which two experimentally derived coefficients are sufficient. The rate process models apply well to the prediction of damage thresholds and less well as the damage becomes complete, since several of the fundamental assumptions are violated. In order to be useful in evaluating laser dosimetry, the kinetic model must be coupled to quantitative pathological analysis. This chapter describes quantitative markers of thermal damage and experimental methods for estimating relevant kinetic coefficients in both constant-temperature and transient thermal history experiments. As expected, transient in vivo thermal history data yield a noisy kinetic plot; however, estimates of the appropriate rate coefficients often can be made.